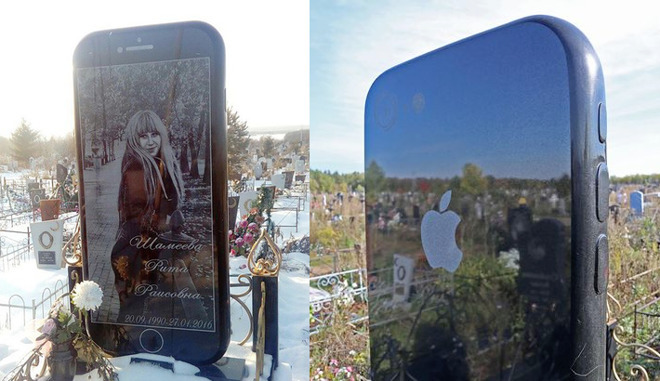 An unusual headstone has been discovered in a Russian cemetery that takes the form of a giant iPhone, a 5-foot tall recreation of the popular smartphone bearing an image of the deceased on the display. Images of the giant iPhone surfaced on Wednesday, after mourners commented to local media about the unusual memorial, reports the Mirror. Erected earlier this year, the stone iPhone commemorates the passing of 25-year-old Rita Shameeva, who died in January 2016 from unknown causes. The iPhone measures 5 foot in height, is made from basalt, and features an image of the deceased on the screen area. The stone itself is quite detailed, with representations of the Home button, earphone speaker, volume and standby buttons, rear camera, and even an Apple logo on the rear, all in a black stone structure with white highlights. The tall nature and unusual design caught the eye of other patrons of the cemetery, with one stating to local press "I thought I was having hallucinations. How can an American smartphone suddenly appear at our cemetery? And such a big one?" Few details are reported about the person's life, aside from being a keen traveller and having friends in Germany. While it is plausible that Shameeva had a passion for smartphones and self portrait photography, it is unlikely that she was a major fan of Apple specifically, as photographs show her using other smartphone brands. It is unclear who produced the gravestone, with the current belief that it was commissioned from a Siberian firm that produces "death accessories."